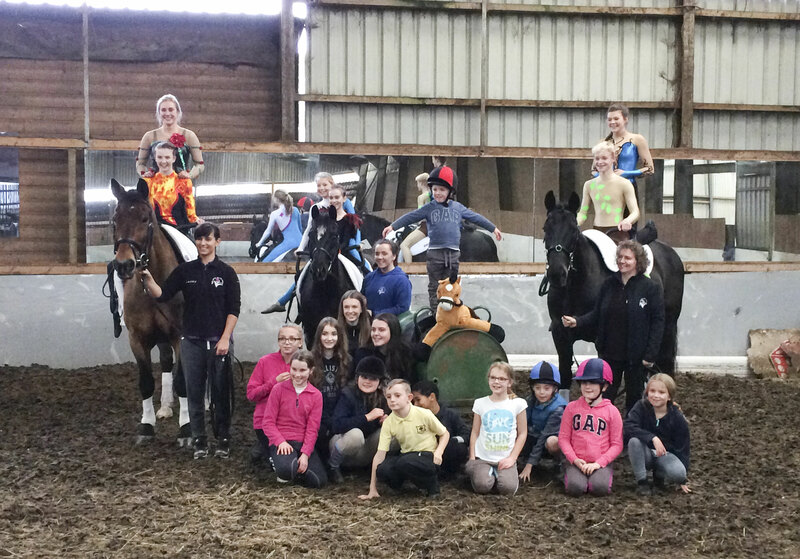 On the 29th October, we had a great time taking Robbie, Darcy and Toby to demonstrate our sport and give staff and pony club members an opportunity to try vaulting. They were very appreciative and we look forward to returning in the future. 2* Senior Female Individual : 2nd Hannah Ballantyne, 3rd Molly Turner on ILPH Islay, lunged by Liz Mackay. 2* Junior Female Individual : 5th Kirstin Henderson on ILPH Islay, lunged by Liz Mackay. 7th Kirstin Henderson on Rum N Coke, lunged by Liz Mackay. 2* Senior Male Individual : 1st Atholl Pettinger, 3rd Jack Wilson on Robbie, lunged by Liz Mackay. 2nd Atholl Pettinger on Rum N Coke, lunged by Liz Mackay. 1* Junior Female Individual : 3rd Alicia Boyle, 6th Heidi Ballantyne, 7th Emily Hardie on Robbie, lunged by Lynn Ballantyne. 1* Junior Male Individual : 1st Mark Porteous on Rum N Coke, lunged by Liz Mackay. 1* Child Female Individual : 4th Sophie Wilson on Dazzling Edition, lunged by Liz Mackay. 6th Emma Leslie, 7th Rachel Leslie, 8th Catriona Marden on Robbie, lunged by Lynn Ballantyne. Senior Pas de Deux : 1st Hannah Ballantyne and Molly Turner on ILPH Islay, lunged by Lynn Ballantyne. Junior Pas de Deux : 2nd Atholl Pettinger and Kirstin Henderson on ILPH Islay, lunged by Liz Mackay. 3rd Heidi Ballantyne and Alicia Boyle on Robbie, lunged by Lynn Ballantyne. Novice Individual : 8th Beth Casasola, 9th Lennon McGregor on Dazzling Edition, lunged by Lynn Ballantyne. Prenovice Individual Canter/Walk (a): 1st Tabitha Peck, 2nd Lana McDougall, 3rd Hopelily Heggie, 4th Zoe McColl on Toby, lunged by Carole Pow. Prenovice Individual Canter/Walk (b): 5th Iona Robertson, 7th Beth Robertson on Toby, lunged by Carole Pow. Walk Pas de Deux (a) : 1st Emma Leslie and Rachel Leslie on ILPH Islay, lunged by Janice Henderson. Walk Pas de Deux (b) : 3rd Tabitha Peck and Zoe McColl, 8th Lana McDougall and Catrina Mackie on Toby, lunged by Carole Pow. 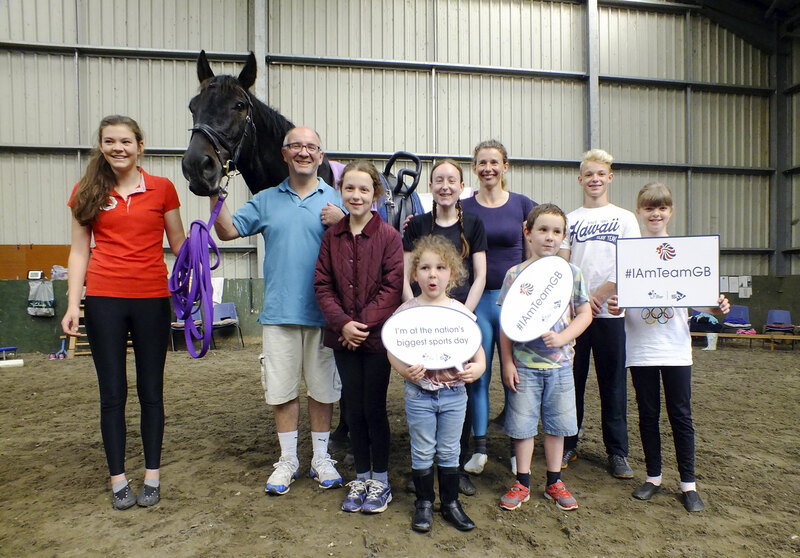 On August 27th, we participated in the nationwide 'I am Team GB' event and offered a taster session. We had 7 attendees, who vaulted on Darcy. Jack and Hannah assisted. Child Female Individual : 3rd Emma Leslie, 4th Codi Hay on Robbie, lunged by Lynn Ballantyne. Junior Female Individual : 7th Alicia Boyle, 8th Heidi Ballantyne on Robbie, lunged by Lynn Ballantyne. Junior Male Individual : 3rd Mark Porteous on Robbie, lunged by Liz Mackay. Child Female Individual : 5th Emma Leslie on Robbie, lunged by Lynn Ballantyne. Junior Female Individual : 3rd Kirstin Henderson on ILPH Islay, lunged by Liz Mackay. Junior Pas de Deux: 2nd Atholl and Kirstin on ILPH Islay, lunged by Liz Mackay. Junior Male Individual: 1st Atholl Pettinger, 3rd Jack Wilson on Robbie, lunged by Liz Mackay. Senior Female Individual : 2nd Hannah Ballantyne, 3rd Lesley Campbell on ILPH Islay, lunged by Liz Mackay. : 5th Celine Michel (SUI) on Dazzling Edition lunged by Liz Mackay. Senior Male Individual: 2nd Colin Michel (SUI) on ILPH Islay, lunged by Liz Mackay. Senior Female Individual: 3rd Hannah Young on Robbie, lunged by Liz Mackay. 6th Alicia Boyle, 7th Heidi Ballantyne on Robbie, lunged by Lynn Ballantyne. 2nd Jack Wilson on Robbie, lunged by Lynn Ballantyne. 5th Emily Hardie on Robbie, lunged by Lynn Ballantyne. 2nd Mark Porteous on Robbie, lunged by Lynn Ballantyne. 4th Codi Hay on Robbie, lunged by lynn Ballantyne. 5th Emma Leslie, 6th Catriona Marden on Dazzling Edition, lunged by Lynn Ballantyne. 2nd Hopelily Heggie on Dazzling Edition, lunged by Hannah Ballantyne. 1st Zoe McColl, 2nd Tabitha Peck on Toby, lunged by Carole Pow. 3rd Lauren Paterson, 5th Iona Robertson on Toby, lunged by Carole Pow. 1st Beth McInroy on Dazzling Edition, lunged by Carole Pow. 2nd Alicia Boyle and Heidi Ballantyne on Robbie, lunged by Lynn Ballantyne. 2nd Mark Porteous and Codi Hay on Dazzling Edition, lunged by Hannah Ballantyne. Hannah Ballantyne and Molly Turner travelled to Switzerland to compete in their first international competition together as a 3* Pas de Deux. They competed on a Swiss horse named Lady. A very special thanks to Silvia Hounder to organising and making the girls time in Switzerland so enjoyable. 2* Senior Female Individual : 3rd Lesley Campbell, 4th Molly Turner, 5th Hannah Ballantyne on ILPH Islay, lunged by Liz Mackay. 6th Molly Turner on Bravour, lunged by Lynn Ballantyne. 2* Junior Female Individual : 3rd Kirstin Henderson on ILPH Islay, lunged by Liz Mackay. 4th Heidi Ballantyne on Robbie, lunged by Liz Mackay. 2* Senior Male Individual : 1st Atholl Pettinger on ILPH Islay, lunged by Liz Mackay. 2nd Jack Wilson on Robbie, lunged by Liz Mackay. 1* Junior Female Individual : 6th Louise Scott on Dazzling Edition, lunged by Carole Pow. 7th Emily on Robbie, lunged by Lynn Ballantyne. 1* Junior Male Individual : 2nd Mark Porteous on Robbie, lunged by Lynn Ballantyne. 1* Child Female Individual : 6th Emma Leslie, 8th Rachel Leslie on Dazzling Edition, lunged by Carole Pow. 7th Catriona Marden, 9th Codi Hay on Robbie, lunged by Lynn Ballantyne. Novice Individual : 4th Sophie Wilson, 8th Amanda Sharp, 9th Beth Casasola, 12th Sophie McDonald on Dazzling Edition, lunged by Lynn Ballantyne. Prenovice Individual Canter/Walk (a): 1st Zoe McColl, 2nd Tabitha Peck on Toby, lunged by Carole Pow. Prenovice Individual Canter/Walk (b): 1st Beth Robertson, 2nd Lauren Paterson, 8th Iona Robertson on Toby, lunged by Carole Pow. Prenovice Individual Canter/Walk (c): 1st Beth McInroy on Dazzling Edition, lunged by Janice Henderson. Walk Pas de Deux (a) : 1st Mark Porteous and Codi Hay. 2nd Emma Leslie and Rachel Leslie. Walk Pas de Deux (b) : 4th Beth Casasola and Sophie MacDonald. Junior Female Individual : 14th Alicia Boyle on Robbie. Junior Male Individual : 2nd Atholl Pettinger, 5th Jack Wilson on Robbie. Junior Female Individual : 17th Kirstin Henderson on ILPH Islay. Junior Pas de Deux : 3rd Kirstin H and Atholl P on ILPH Islay. All lunged by Liz Mackay. 2nd Molly Turner, 3rd Lesley Campbell, 4th Hannah Ballantyne all on ILPH Islay, lunged by Liz Mackay. 5th Hannah Ballantyne, 6th Molly Turner both on Bravour lunged by Lynn Ballantyne. 5th Kirstin Henderson on ILPH Islay, lunged by Liz Mackay. 6th Alicia Boyle, 9th Heidi Ballantyne on Robbie, lunged by Liz Mackay. 1st Atholl Pettinger on ILPH Islay, lunged by Liz Mackay. 3rd Louise Scott on Dazzling Edition, lunged by Carole Pow. 2nd Mark Porteous on Dazzling Edition, lunged by Carole Pow. 9th Catriona Marden, 10th Rachel Leslie, 11th Emma Leslie, 12th Codi Hay all on Dazzling Edition, lunged by Lynn Ballantyne. 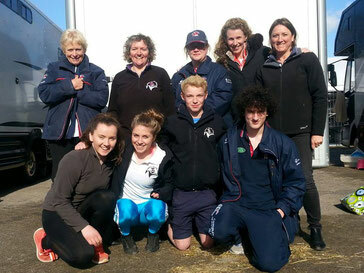 1st Kinross - Mark P, Rachel L, Emma L, Codi H, Catriona M and Beth C on Robbie lunged by Lynn Ballantyne. 1st Sophie Wilson, 5th Beth Casasola on Bravour. 16th Iona Robertson, 17th Lauren Paterson on Toby. 3rd Amanda Sharp, 4th Sophie MacDonald on Bravour. All lunged by Liz Mackay on ILPH Islay. 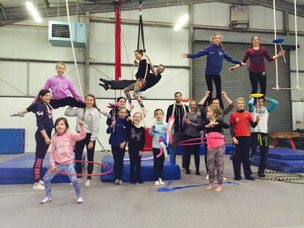 In January, 16 vaulters of all ages and abilities enjoyed an introduction to circus skills at Adventure Circus in Perth. Everyone was involved in a very rigorous warm up before trying their hand at some circus skills including trapeze, silks, the hoop and juggling. 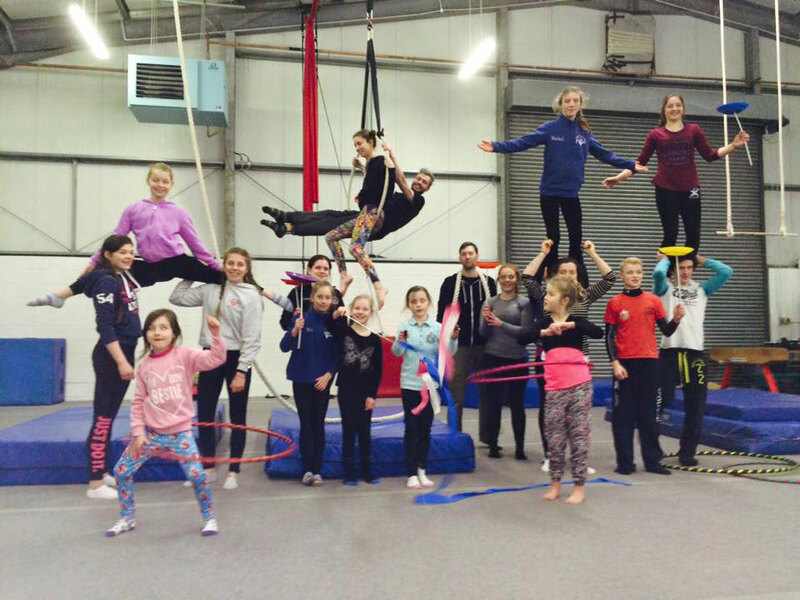 The circus coaches were very impressed with the body tension, straight legs and pointed toes which come more natural to vaulters then other children. All the vaulters enjoyed the experience and are looking forward to having the opportunity to go back again.